Tomato Patch: Should I take a hint—or two or three? Our thermometer read 54°F early this morning—a refreshing temperature for sleeping with open windows—but also a hint to central Maryland gardeners that fall is coming with a “first fall frost” sometime in October. The cool temperature also reminded me to keep tomatoes picked as they ripen because prolonged temperatures below 55° will turn them mushy—just as they turn when we put them for a few days in our 38° refrigerators. The brisk morning temperature isn’t the only hint of fall in our gardens. The bright faces of sunflowers have faded and now heavy with seeds the heads seemingly glare at Amish Paste tomatoes that need picking—or are they staring at weeds that need hoeing? Throughout the Tomato Patch, early blight is working its way up tomato vines, killing leaf after leaf, even on supposedly blight-resistant cultivars such as Juliet Hybrid, one of our favorites. Powdery mildew and other leaf diseases have decimated our zucchini and Pic-N-Pic summer squash, so I’ve pulled the plants so adjacent strawberry plants can get a good dose of September sun. After harvesting and eating or giving away buckets of squash, I’ll not miss the squash one bit. 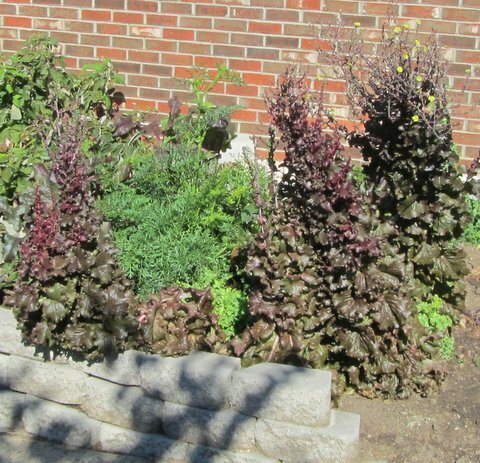 Nearby, unpicked Red Sails lettuce has bolted and displays delicate yellow flowers—and leaves of a Short ‘n Sweet carrot plant are waist high and threaten to bloom. And the brightest spot in the Tomato Patch? 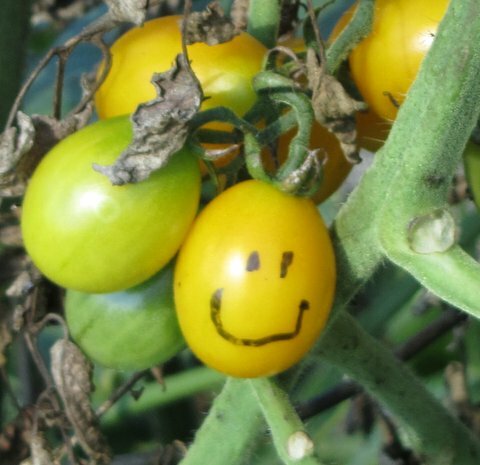 Yellow Plum tomatoes still beam like happy faces, and I cannot ignore the last few Celebrity and Amish Paste tomatoes that will make great last-of-season sandwiches and sauce with “real” tomato flavor—just like it used to be and still is for backyard gardeners. But the chill in the air sparks a thought beyond “last pickings.” I need to get serious about cleaning out the dead stuff. 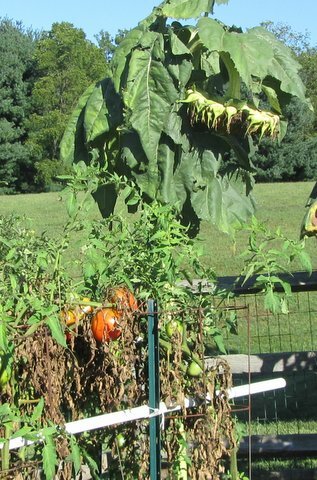 Brown marmorated stink bugs and a variety of other insects may think the collapsed squash leaves will make great overwintering quarter. And I think it “best gardening practice” to cart away the mildew- and blight-damaged squash and tomato plants rather than letting them lie overwinter to encourage disease outbreaks next year. Two thumbs up! Fall is in the air! Now it’s time to use those thumbs to get a grip on my hoe and pitchfork and clean up this year’s garden refuse. Do not despair, there are still warm days ahead. My honey bees are waiting for them. They need to collect pollen and nectar for successful overwintering. Asters and goldenrod are main source of food for honeybees. If honeybees are unable to collect sufficient amount, a beekeeper must provide sugar syrup to assure a survival of his/her colonies. Tomato production in my garden is also winding down with “Sweet 100 cherry tomato” plant still producing, despite early blight. On a positive note, “Stupice” a tomato of a Czech origin is producing well without being affected by the blight. Also, self seeded cilantro and dill plants are nicely growing. Ever heard of beef with dill sauce? Send some of your bees over to feed on our goldenrod, which is blooming just outside my study window. I hope you have a great harvest. I picked several colanders of tomatoes this morning–mostly Amish Paste and cherries (Juliet, Sungold, Super Sweet 100, and Yellow Plum), but it's obvious this year's garden is in a general decline, Paul. No, I haven't heard of beef with dill sauce, but your mere mention of it has me drooling as I type.